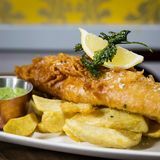 "A newly refurbished bar, elegant private rooms and the original arches of the champagne vaults offer endless options for dining and events in this characterful venue situated in the heart of the West End. A unique space for exclusive parties and weddings as well as smart dining, tastings and private meetings or presentations. Locals love the genuine, attentive service and the refreshingly down to earth prices for such a smart part of town! Award winning steaks from our butcher Donald Russell are amongst the firm favourites, accompanied by an impressive wine list drawn from the vast Davy cellars, craft beers and the ever popular Davy’s Old Wallop still served in pewter tankards." What did you think of Davy's at St James? Davys is not the greatest pub but worth stopping into if you're in the area. They show the footy on tv and have got good beers. Davus also has some good food on offer. I really like Davys at St James as it never gets any youngsters in there. The decor of the place has a more mature feel to it and I guess that's why the riff raff don't go in there. It's a great place to have a business lunch or a few after work beers. It's also pretty good for food. It serves standard bar food but the quality is quite high and service is always good. If you are looking for a nice place to relax with some food, I recommend Davys at St James - it's a good little venue. Great find,service and food were excellent,sure to return soon! Davys at St James is a great hideaway for a cosy evening drink or quiet lunchtime meal. Hidden away down Crown Passage is Davys at St James - an underground wine bar and restaurant filling the space of an old diamond mine. The dark bar is lit by candles and decorated with various wine, Champagne and port bottles with signs advertising their cigars and vintage beverages. Davys at St James has a very intimate feel as you come down the winding staircase into the stone floored, bare brick venue. The space is neatly sectioned into the main bar and dining room, as well as having a separate room for functions and another area that still has the arches of the original diamond vaults. 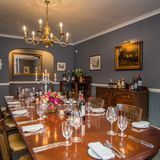 The staff are extremely pleasant and very attentive to the needs of all their guests, the bar offering something for everyone with quiz nights and wine tasting sessions. 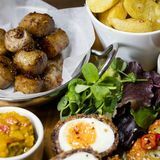 With a menu that adds seasonal dishes monthly, there are some unusual choices available; however, there is no vegetarian option for the main course. 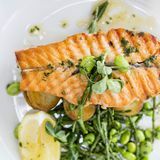 The starters are generously sized portions; particularly good is the trout fillet, which is full of flavour and comes served with a salad that is crisp and fresh. The buffalo mozzarella comes accompanied with balsamic vinegar and Mediterranean vegetables, giving the cheese an unusual, sweet taste. The main courses are also a fair size; the chicken is cooked to have a crisp skin and a moist centre, complemented by a light garlic dressing. The menu boasts of the quality of its Angus ribeye steak, but this isn’t the best offering on their menu, and could be accused of being a bit chewy. The homemade chunky chips make a wonderful change from the skinny fries that most bars serve. A dessert of apple and forest fruit crumble is overpowered by cinnamon and made using muesli as a topping, which can make it soggy. The chocolate and orange steamed pudding is definitely a preferable choice - full of rich flavours and a sauce perfect for a chocolate lover. Wine is a speciality at Davys at St James and the staff are very knowledgeable about what's on offer. The wine list adds monthly additions and ranges from vintage classics to a 2007 Sauvignon Blanc. The wine and Champagne are averagely priced for the area, with some cheaper options available. There is, however, only one rose on the menu. The bar also offers a range of ports, including a vintage 1995 option, which is something that makes Davys at St James stand out. There choices of soft drinks and beers are limited. Although the food is not perfect, Davys at St James offers a drink list that can make up for it if you're a wine lover. More a bar than a restaurant, they provide reasonably priced, filling meals in a wonderful atmosphere with amazing wines.